The impact of the school-to prison pipeline is stark: zero-tolerance policies in struggling, school districts result in many students, mainly low-income, African American males being incarcerated at high rates, according to this infographic from the American Civil Liberties Union . The U.S. incarceration rate is the highest of any country in the world, and this rate is particularly high for urban cities throughout the country. Once incarcerated, individuals re-entering the world and workforce struggle to find employment, because of their criminal record. This added barrier can lead many who have a history of incarceration to turn back to alternative economies that often end them back up in America’s prison system. One social intervention for this systemic problem is coming from innovative urban farms. Across the country, urban farms are beginning to employ individuals who would otherwise struggle to find stable employment, and through job-training programs, are assisting the previously incarcerated or at-risk or youth, helping them towards educational attainment and stable full-time employment. 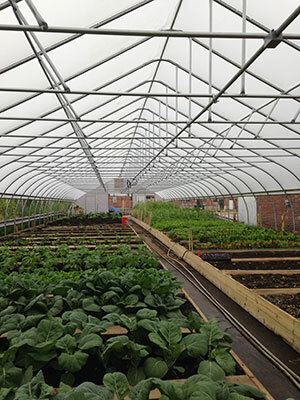 While many urban farms have inadvertently helped to intervene on this issue, offering jobs and job training to this specific population, the following are five urban farms that have embedded this cause into the purpose of their organization. Established in 2010, RecoveryPark is embarking on the implementation stage of creating a three-tiered business model to provide careers for individuals struggling to find a job, including those who have previously been incarcerated or are a recovering addict, while providing fresh healthy foods to local residents. The non-profit will be establishing an urban farm on a 2,475 acre plot of land, as well as a food processing facility and an indoor aquaponic farm. The first 30-acre farm plot has just become operational, producing fresh leafy greens in a hoop house on a previously empty parking lot. The organization hopes to ultimately create 18,000 new jobs for Detroit residents within the next ten years, with a focus on individuals who would otherwise face adversity in finding full-time employment. Established in 1995, Seattle Youth Garden Works has employed teens and young adults who are either homeless or have recently been involved in the juvenile justice system. The organization works to provide their employees with positive reinforcement for their hard work, and education in areas of agriculture, cooking, nutrition, entrepreneurship, and resume building. The program aims to guide youth participants towards education and stable employment. The 16 – 21 year old employees of Seattle Youth Garden Works gain experience in growing food, harvesting, and selling their produce at a local farmers’ market. In collaboration with the Chicago Botanic Garden, the Windy City Harvest Corps has offered the formerly incarcerated an opportunity to gain job training in urban agriculture to ease their re-entry process since 2009. Between 2009 and 2013, the program offered 13-week transitional jobs to 60 to 90 recently released individuals per year, where they were taught applicable job skills and provided both opportunity and structure. After this period, many individuals went on to work for the various Windy City Harvest sites, as well as at other full time jobs throughout Chicago. Starting in January of 2014, the garden site has shifted focus to working with at-risk youth in collaboration with the Illinois Department of Juvenile Justice, in hopes of creating education and opportunity that can intervene in the School to Prison Pipeline with youth ages 17 to 21. To date, Sustainable Alamance has helped to place 46 previously incarcerated men and women into full time jobs. The faith-based organization works to help these individuals by offering them employment on their urban farm, and by encouraging them to pursue educational opportunities. Sustainable Alamance develops and fosters close relationships with each of their employees in order to help understand their needs and to develop each person as an individual. The organization has just finished creating their CrossTown Café, which serves the food grown in the urban farm to the local community in need, thus helping to inspire a ripple effect of community service throughout the community. Furthermore, the organization plans to create a Faith and Community Economic Sustainability Center to help further their goals of education and decreasing the recidivism rate of the individuals they help. Another organization based in Chicago, Illinois, Growing Home Inc. has built a business model out of the idea that urban agriculture can be used as a job training and employment hub, while providing the community with locally grown healthy food through farmers markets, farm stands, and Community Supported Agriculture shares. The organization focuses on employing individuals who have barriers to employment such as a criminal record, while providing them with income and extensive job training. Growing Home helps their employees to identify and overcome their individual barriers to employment, and find full time jobs.